I have been immensely disappointed with the recent and not so recent US imports to Cardiff’s burgeoning burger scene in the form of Shake Shack (extortionately priced miniscule, albeit decent enough tasting, burgers) and Five Guys (pricey and not very good). I have nothing against more burger places in Cardiff (competition is generally healthy) as long as they deliver a good value (not the same as just cheap), quality product. I don’t mind paying a fair price for a good burger, but object to being asked to pay a premium price for one that turns out to be not very good or to be the size of a fifty pence piece. 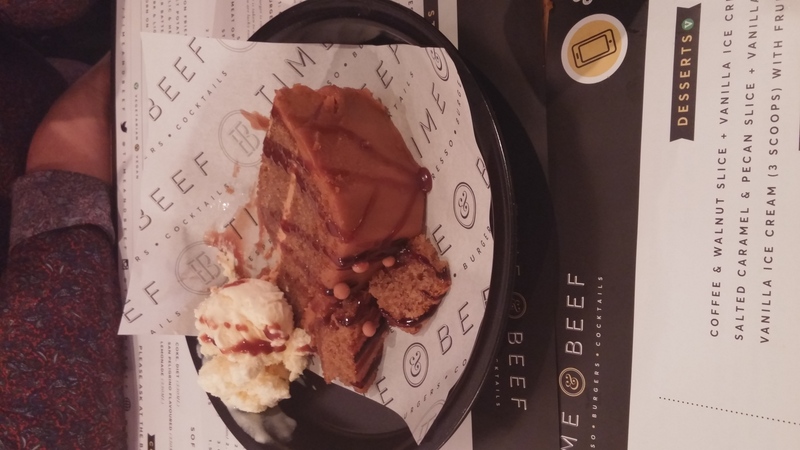 I, therefore, had no qualms about belatedly trying out the newish kid on the block – Time & Beef in Canton, Cardiff on the Bank Holiday weekend. I went fervently hoping home grown would trump the US imports (not difficult I have to say) whose slick marketing seem to have persuaded us that a premium price must always mean a good burger. – quality food not fast food (personally I think you can have both). Some could say this is all a bit gimmicky, but I like the clear suggestion it gives that they actually care. Inside it is a nice space, with all the furniture reclaimed. 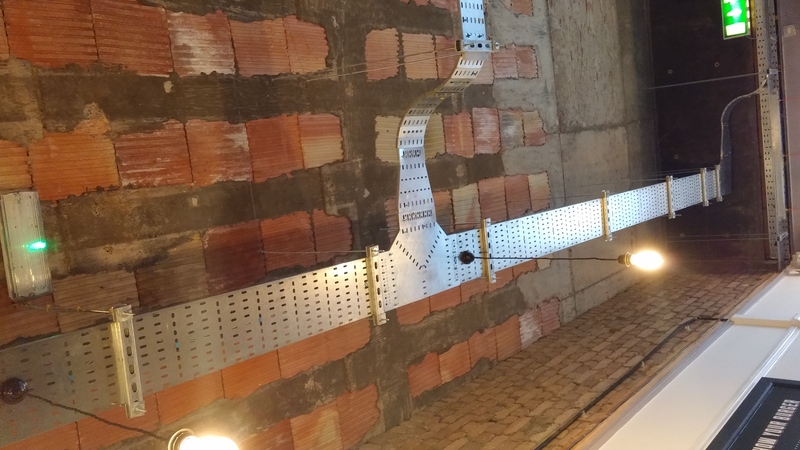 The only thing that detracts is the ceiling – I know the industrial look is de rigueur, but this looks more “unfinished building site” to me. The menu works, as the post title suggests, on a build your own burger basis. 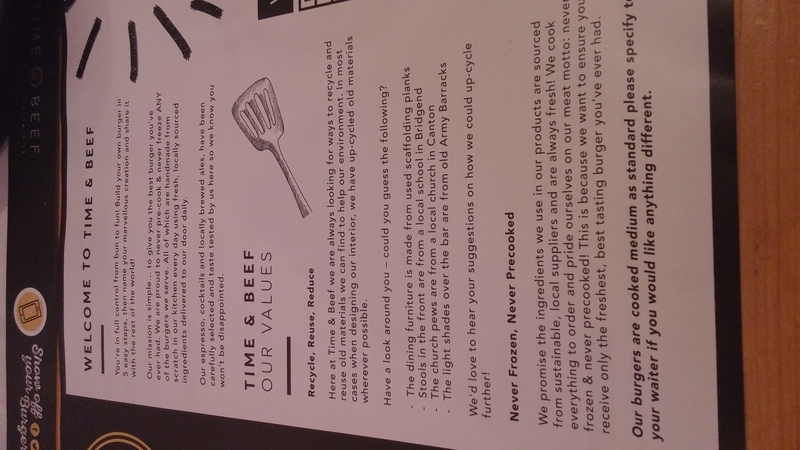 I like very much the idea that I can design my burger to my liking (being quite particular on the burger front). This includes a choice of bun, patty (beef, lamb, chicken, fish or veggie), toppings and sauce. The options available are myriad and could result in a truly freakish creation. Do people really add crisps (an option here) to the inside of a burger and bun – if so why? The one thing conspicuous by its absence in terms of the steps to building your burger is how you would like the patty cooked. Regular readers will know I like a burger cooked medium rare and rile against not being giving the option to have my burger cooked so (or at least being given an explanation as to why this is not possible). 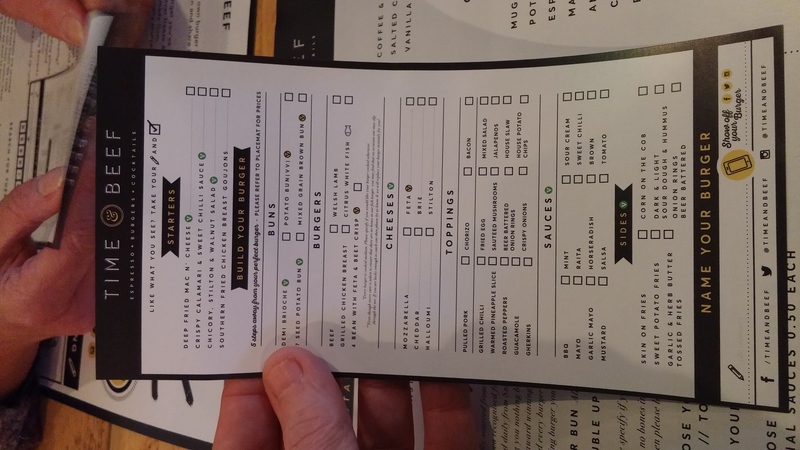 With all the talk here of various steps to building your own burger, it seems odd to me (and a tad disappointing) that “How would you like it cooked?” is not one of them. 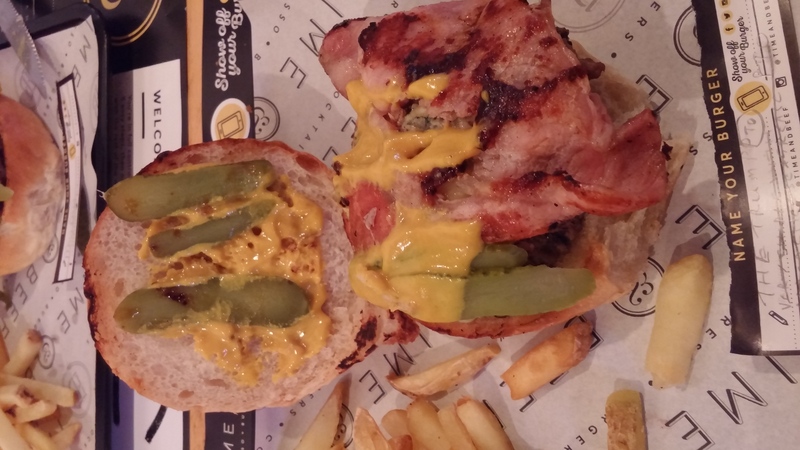 The blurb on the menu states that the burgers are cooked medium unless requested otherwise. On this basis, I asked if I could have mine cooked medium rare. I was told that this was not possible as they had to cook burgers (due to the health and safety police – my words not their’s) to a minimum temperature of 75°c ( I cook mine at home to 57°c but mince my own meat for burgers). As I understand it, this means they must buy in ready minced meat rather than mince the meat in house. Personally (don’t care what the food police say) I think a burger is at its best served medium rare (I have never suffered any negative side effects from eating a medium rare burger at home or out). The base price of each burger is £7, with toppings (including cheese) an extra £1 each bar from the meat toppings (pulled pork, bacon or chorizo), which are £2. Sides are priced at between £2 and £3. 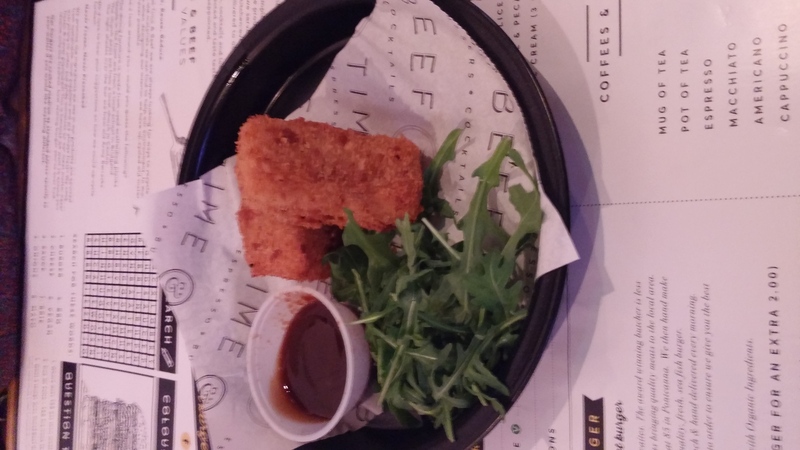 Before the main burger event, there is a short list of starters, with the American burger bar/diner classics on it of Fried Mac ‘N’ Cheese and Southern fried chicken tenders/goujons and a nice sounding blue cheese and chicory salad. Must say I thought the inclusion of calamares and chilli sauce a bit out of kilter (thank the Lord no option to build that into your burger) with everything else. I would replace with wings or something of that ilk personally. I went for the fried Mac ‘n’ Cheese (£5). Bit disappointing this. Underseasoned and lacking in cheese flavour (thus a bit bland – an idea would be to add a bit of cayenne pepper into the cheese sauce and/or breading).The portion (two sticks) was also a bit stingey for the £5 price tag. It came with undressed rocket. Bit of a bugbear of mine undressed salad – just rabbit food without a decent dressing if you ask me. I did like the brown sauce it came with, which had a nice spicy tang to it. 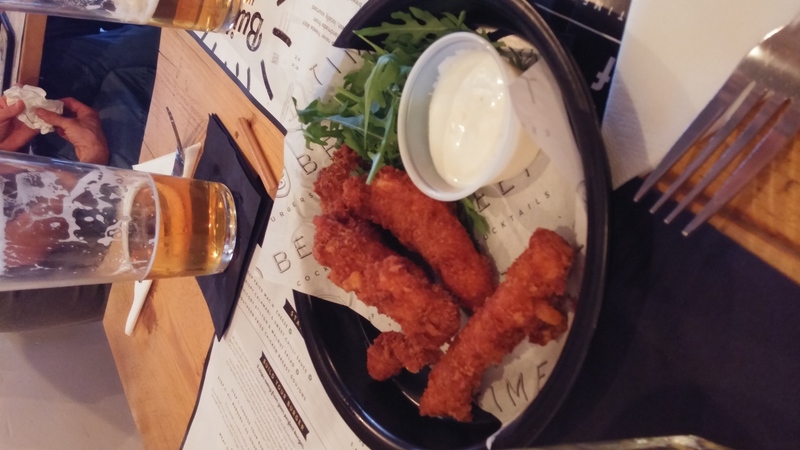 The southern fried chicken goujons/tenders (£6), ordered by others, were much better with a nicely crisp, spicy coating and a decent sized portion. Again the accompanying sauce was very good, spiked with plenty of garlic. On to the main event, the burger. I choose a beef patty- £7 (regrettably cooked medium), in a potato roll with toppings of stilton – £1, bacon – £2 and gherkins/pickles – £1. To this I added a sauce of mustard – making a grand total of £11. Far from cheap, but it was a big burger and it filled me up nicely rather than leaving me still hungry. I called it (you can name your creation)”The Trump” based on it being “quite simple with added cheese and grease and it will get us into a pickle” and in the hope it would trump the City centre’s US imports. 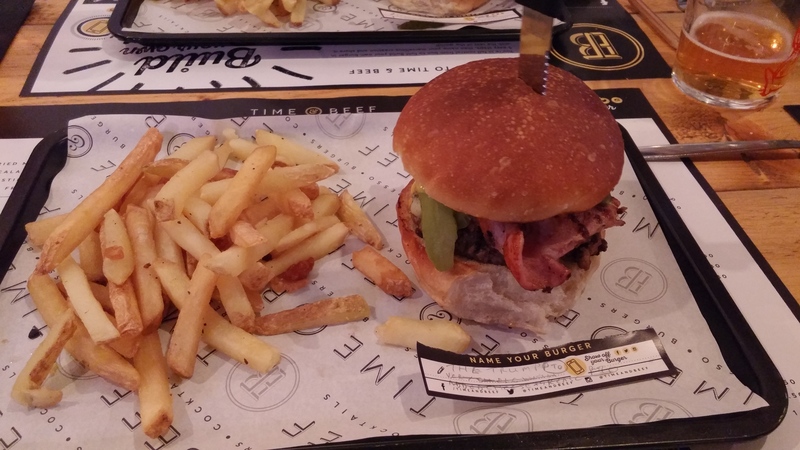 The burger itself was tasty and juicy and the toppings were generous. There was that nice beefiness to it that denotes a good burger. The £2 premium for the bacon could be regarded as a bit steep, but I suppose it was a reasonable sized rasher. A quid for gherkins, however, did seem quite excessive to me. One thing I would suggest is that they state the mustard used is quite hot. I had assumed it would be the mild and sweet American type. The amount of hot mustard used was quite generous and I was somewhat unprepared when I took the first large bite of my burger. Other burgers (all beef) went down very well. These included (as named by us) a “Cheddar Gorge – ous” (a cheese burger) and a “Gerhard (Berger)” and a “May Day” (emergency burger required and it was May Day Bank Holiday weekend). Others declined to join in the name game. On to the sides, onion rings (£2 – I think) were pronounced (I didn’t get a look in) as very good – crisp with a light rather than soggy batter and properly seasoned. 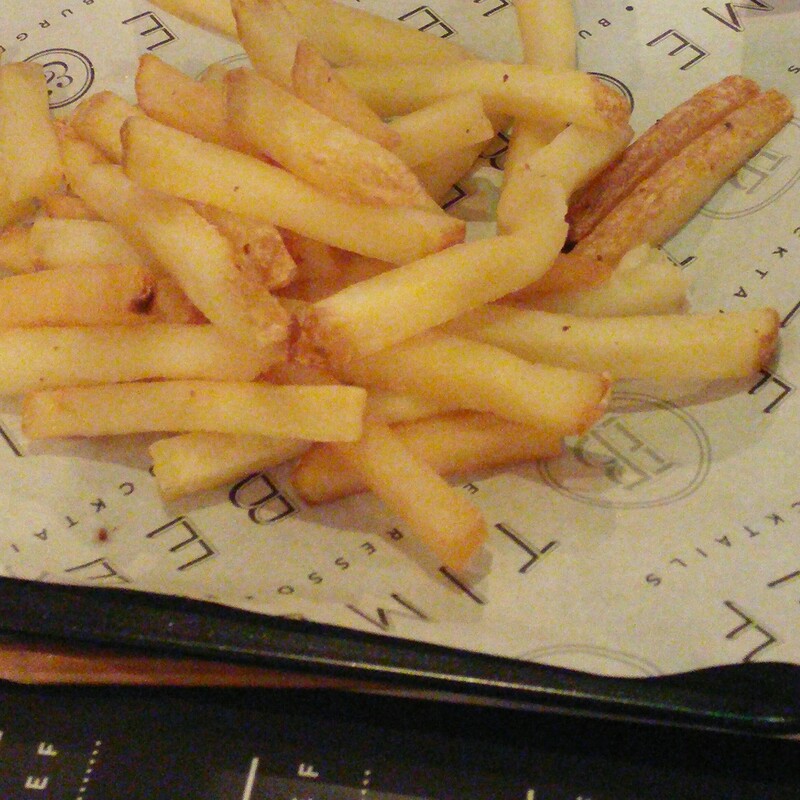 Chips (skin on – £2 – and tossed in a herb and garlic butter – £3) were a bit of a let down. 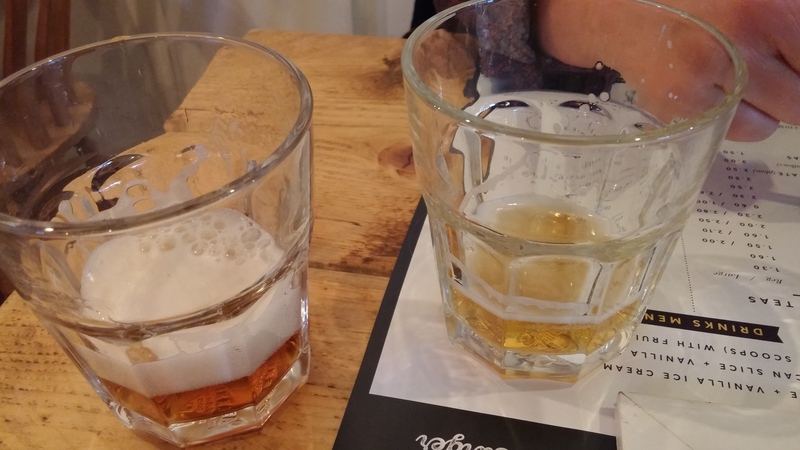 Both mine and Mrs. SF’s were a bit pale, limp and not that hot (friend’s ones were a bit better but still not great). Needed a touch more time in the fryer. Mine also lacked anything other than the vaguest hint of the promised herb and garlic butter (certainly not worth the extra quid they cost over the standard fries). 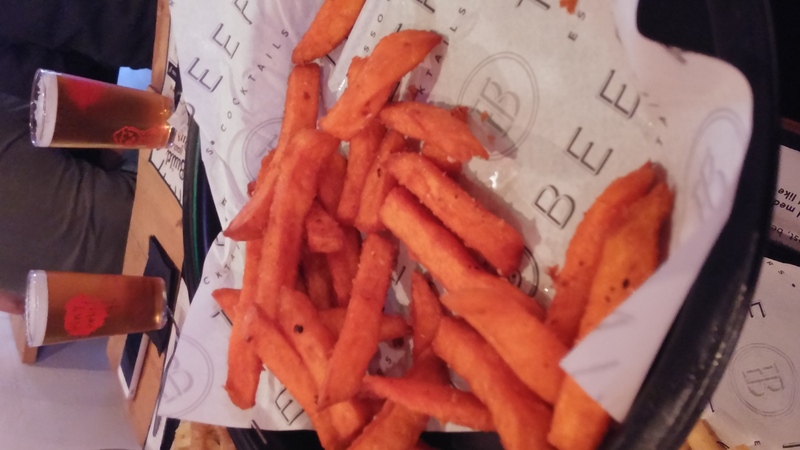 A side of sweet potato fries – ordered by our friends (£3) – was much better. These were piping hot, crisp on the outside and fluffy on the inside – they were everything the potato fries should have been. Easily sorted this issue by way of more fryer time for the standard potato fries. There is a short selection of puds available. Nice desert this – can imagine lovely also with one of their coffees in the afternoon, as would the coffee walnut cake one of our friends choose. Something like a Malbec – always good with beef – would be a good addition to the wine list, as would a Gruner Veltliner that would work well with a chicken or fish burger loaded up with appropriate toppings and a Rioja for the lamb burger. 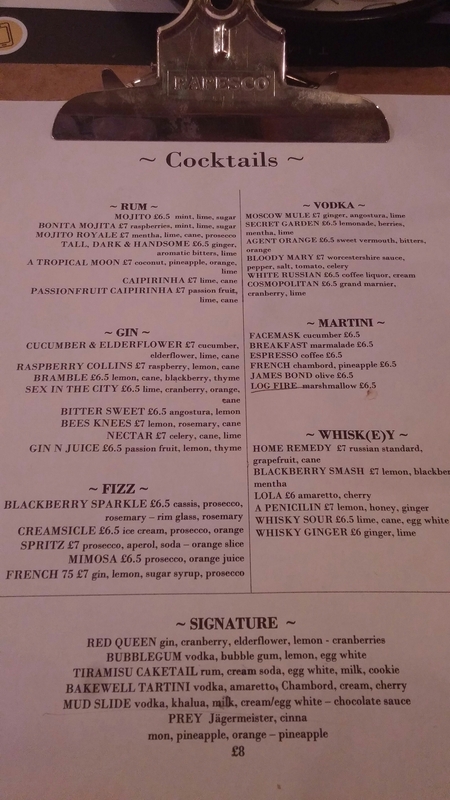 They pride themselves on their cocktails and whilst I am not much of a cocktail drinker the list looks very good for those that are. Mrs SF looked on enviously as a fine looking espresso martini was made at the bar. 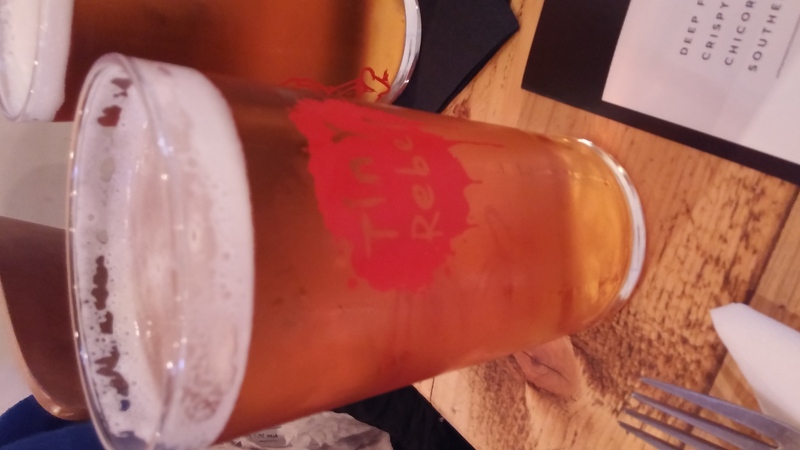 We decided on beer and it was pleasing to see that they had both Furbar and Cwtch from Tiny Rebel on tap- £4 a pint). Mrs. SF couldn’t decide which to go for and she was given a taste of each to make up her mind (nice touch that – service was very good throughout). We all went for the Furbar and very nice it was too. On the soft drinks front there is a good selection of coffees and a somewhat more limited section of cold drinks. An idea would be to add a couple of mocktails to the list to give the designated driver a bit more variety. I had high hopes for Time & Beef and (bar from a couple of niggles) I was pretty happy with what I got. 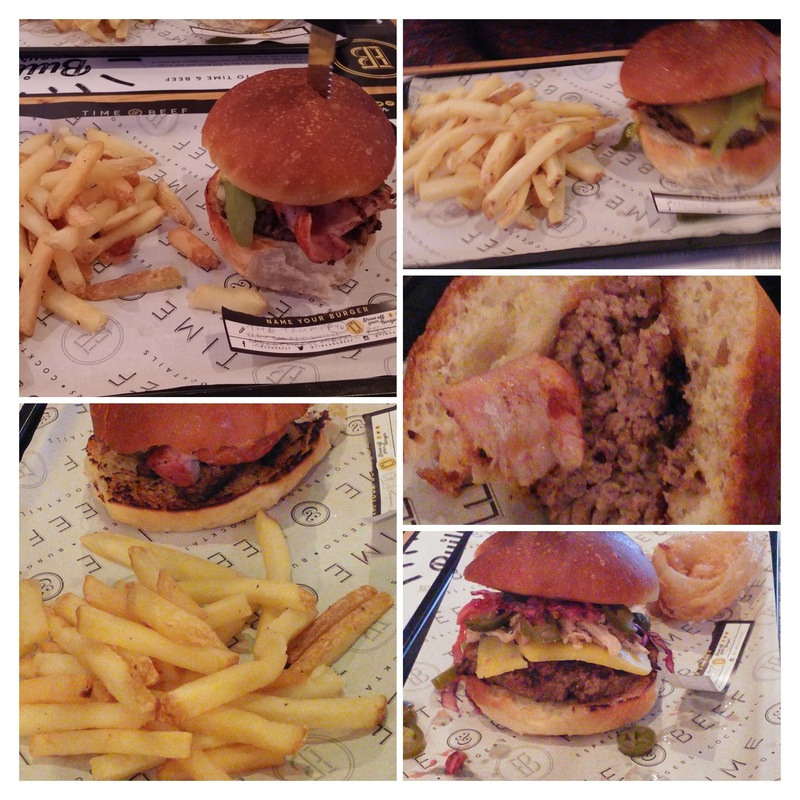 They deliver a quality patty and give you the building blocks to make a really good burger that meets your exact tastes. It is also a substantial burger that fills you up (unlike some I could mention). Price wise we paid £121 (ex tip) for 5 people including starters, burgers, multiple side, puds and quite a few beers. That isn’t cheap and some of the add ons (£1 for gherkins, for example) seems a bit excessive, but it is (in my view) a good addition to the burgeoning Canton food scene. 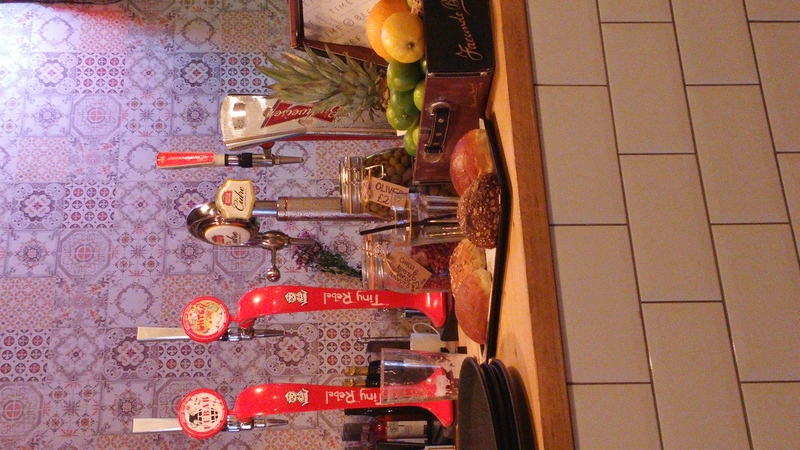 The independent London burger joints (Meat Liquor/Market, Honest Burger, Patty & Bun etc.) 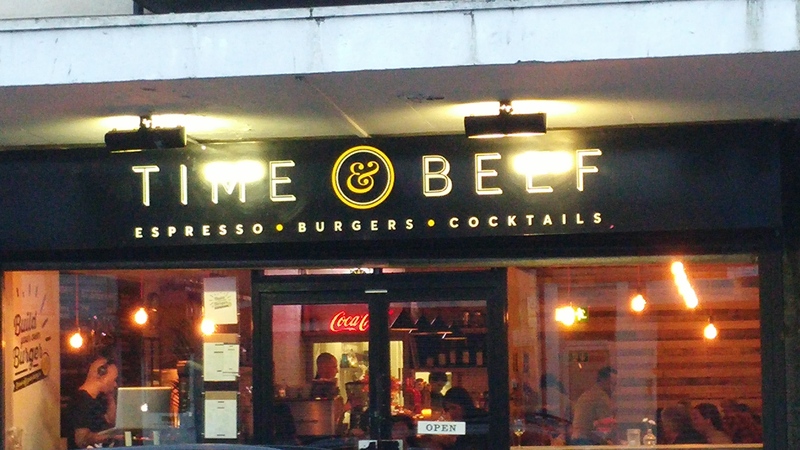 are better (but aren’t in Cardiff and unlikely to come anytime soon) and I think Got Beef has the edge over it in Cardiff, but I would take this place any day over the US imports in Cardiff City centre. Would I go back? Definitely – nice place, nice food, nice beer and nice people (and more conveniently located for me than Got Beef). I also like the fact that you can book here. I do, however, think for the price I should be able to have my burger here cooked my way (medium rare). Could have called it “the Sinatra” then. Breakfast is available (not based on the “build your own” burger menu) as is coffee (they have an extensive coffee menu) and cake. I’m always a little shocked by how pricey burgers can be these days… £11 for your creation wasn’t too shabby but agree on the exorbitant pickles! 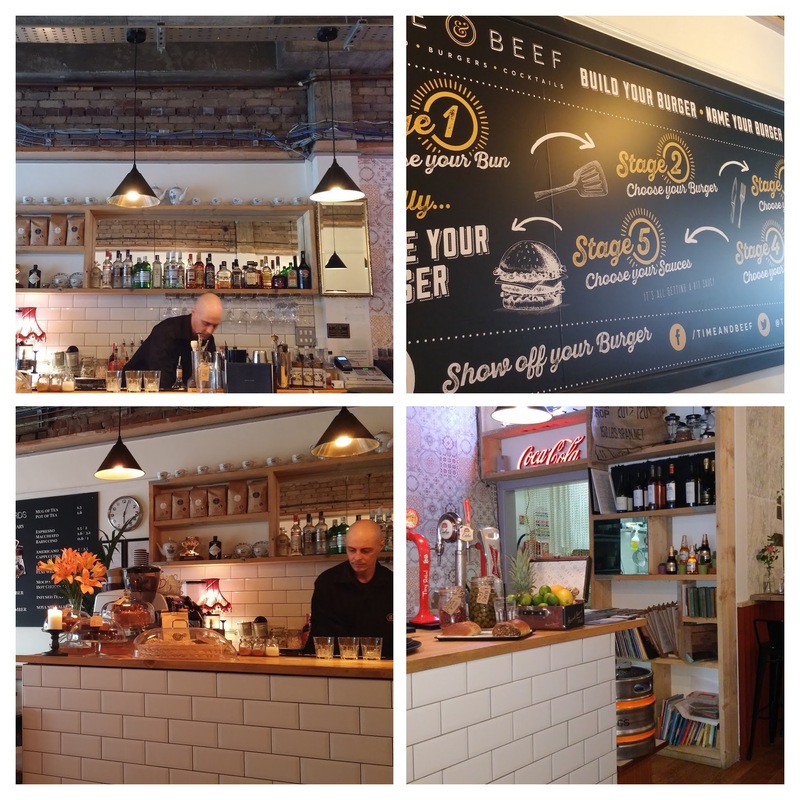 I’m a big fan of Dip & Flip in London – trumps Honest, GBK, Byron etc for me! 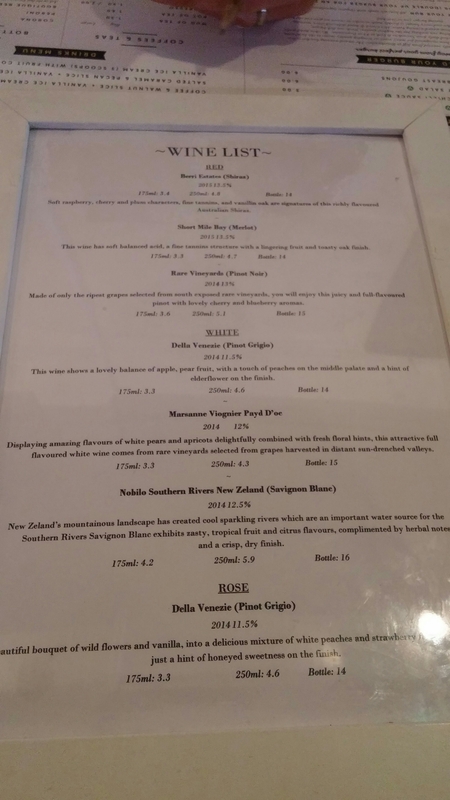 This entry was posted on May 8, 2016 by solicitingflavours in Argentinian wine, Bacon, Beer, Breakfast, Burger, burgers, Cafe, cake, Cardiff, Cardiff restaurant, cheese, coffee, craft beer, desserts, Diner, Drink, Fast food, Food, Food and wine products, New restaurant Cardiff, Non alcoholic drink, Real ale, Red Wine, Restaurant Review, review, Sandwich, Tempranillo, Time & Beef, Wales, White wine, wine.